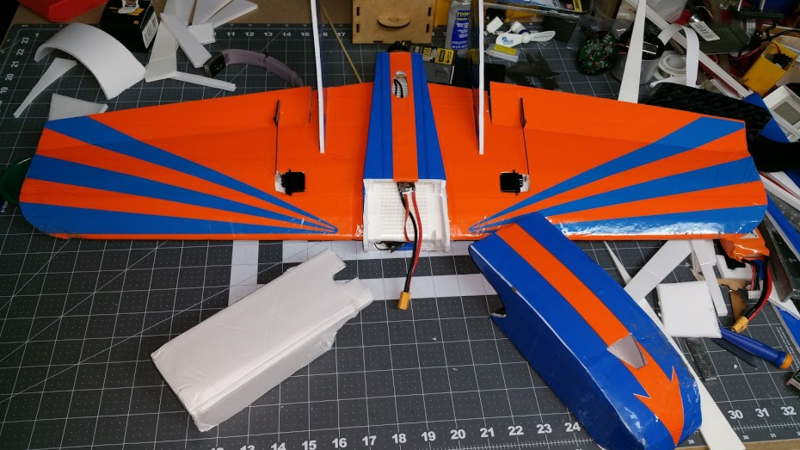 I have 2 crashes to describe, (sorry no Photos), the first was a case of severe brain fade when I took out my Ugly stick, plugged in the Ailerons and flaps, fitted the wing and a flight battery. Did a quick control surface dance listening for the servos as all of this time I was almost trying to answer the usual twenty questions of a newbie at our local club. Anyway I taxied out, opened the throttle and took off. Immediately it started a slow bank/roll to the right and nothing I could do was able to stop it. It climbed to about 20 metres as it slowly circled back towards a line of trees wherein it parked itself. 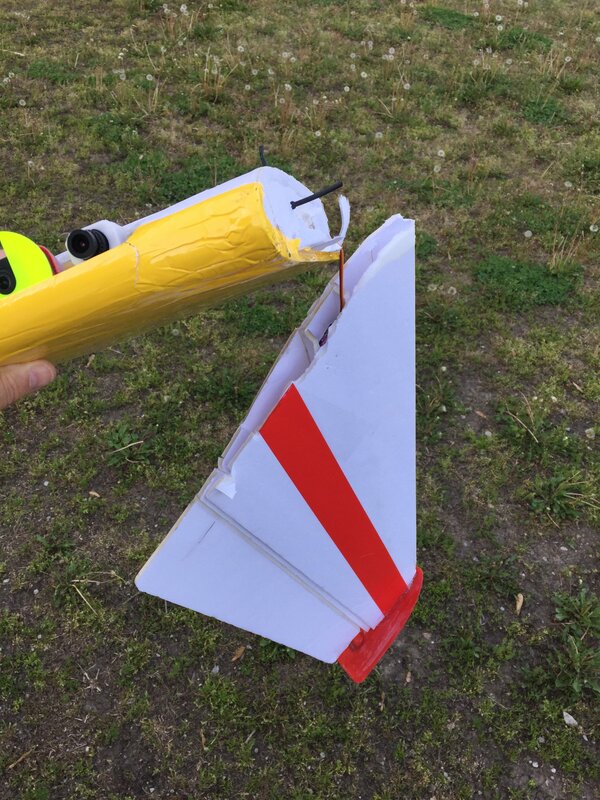 After getting it down I found that I had plugged the aileron lead into the Rx incorrectly and so I had no ailerons. Anyway I refitted the aileron lead Properly, did a quick inspection and took off properly this time. ABSOLUTELY NO DAMAGE TO THE PLANE, my ego was the only casualty! 2 crashes one due to poor preflight and the other due to complacency. Even experienced pilots bite the turf occasionally! Crashed my Hummer EPP 3D into a tree whilst being stupid FPVing around... no damage other then a prop. gotta love EPP! The first FT plane I ever build is the FT Simple Soarer. I built it about the time I started posting here. (I think) I have never flow it except across the yard. I have recent had some odd glitch with my "A" motors. and I had only a few planes ready for the "C" pack I had functioning. the Simple soarer had been calling me as of late. so I fit a C pack in and though today's the day. Due to obligations, I had run out of time before my obligation, but decided to go after to the field and see about maidening the plane I was looking to Motor it up high, glide and generally have fun. however at this point the winds picked up to about 6 knots. (bent at 2nd stripe?) with rain clouds on the horizon moving sideways and away. I had landing gear for ground take-offs. I have only every done slope soaring maybe three times on the sim. only once with some success/enjoyment. but is was very white knuckle ride for me. I will call this both a maiden for me and the plane. Full throttle up and away. it lifted and started to climb. and get pushed fast windward. The prop near full throttle was only causing high alpha and more push. I am used to 4 channel flying not 3 so I was trying to roll the craft to counter the wind induce roll out. Then I remembered - Rudder. Got things a bit under control, but now I'm looking back at the plane. trying to bring it through the wind as I fought a balance point behind the wing lift. after doing a few loops and twisting. I managed to nose it down to gain some forward distance, with heavy throttle control and hard sticking on the controls I was able to plop it down on the runway. I call that success. After the cartwheel landing, there was another string of maladies the just put a second decent flight off a while. 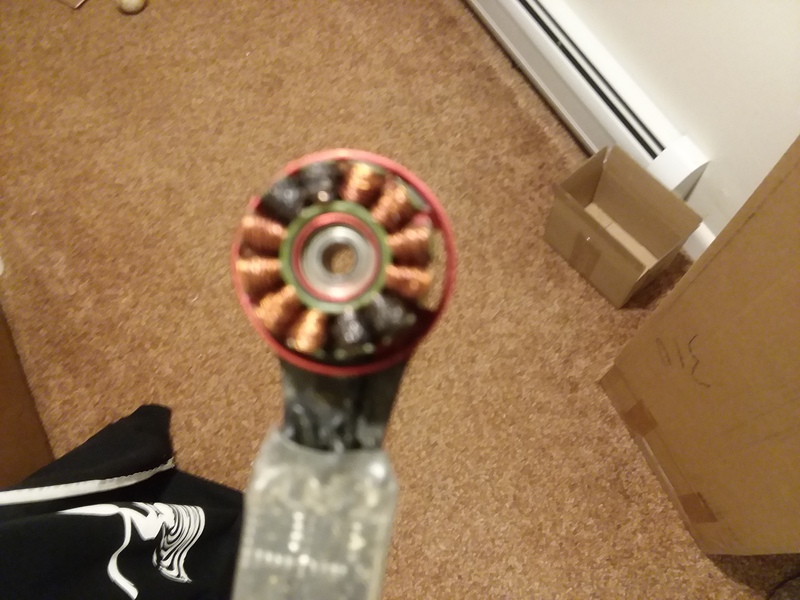 (mount nuts vibrated off, prop collar with the prop spun right off the plane mid flight, and then the tape holding the firewall on (regular packing tape) gave out causing the motor and fire wall to loose from pod. Remember, this i MY FIRST build. You can see this plane is better suited to calmer winds. It was a fun challenge to slope soar at the local flat field, and a joy to watch and fly. I can't wait to give it a go under better conditions. So fr it has launched flying wings, EDFs, Tiny Trainers, Bixlers, and more besides all without a single crash or poor launch. Today it was tried with a heavy EDF and performed admirably launching the plane into the air at well above stall speed befpre the motor was started. Here 3 have already been made locally! Does it count as a crash if nothing broke? I did a whole battery worth of crash and goes today. I still haven’t gotten this whole controlled landing thing down yet. The only damage was my 10” prop is now an 8” prop. It landed right in the middle of the biggest blackberry bush I've ever seen, about 200 meters from side to side, took an hour to cut our way through to it, no damage other than the foamboard wing tips being bent a bit. have another taped up to foam board but haven't cut yet. the 3 flights i did get were really nice though. What's the saying?... Video or it didn't happen. Make sure you get video , interested to see the outcome as well! I actually got to get out today and fly with friends who have trucks. Was a day of small issues for everyone. We managed to coordinate working gear to get some chase footage. MY 4th battery I crashed the Aliein and cut and esc wire. I flew Taz on 4s the one flight when the footage was shot. The last flight if the day was gonna be a 5s run to show them how much faster Taz was then the Alien. No crashes at all on Taz in the last few weeks. I was shocked when I plugged in the 5s pack about 5 or so minutes after the 4s film run and one if the motors insta smoked for no obvious reason. although all 3 suffered damage, all 3 still are in flyable shape. 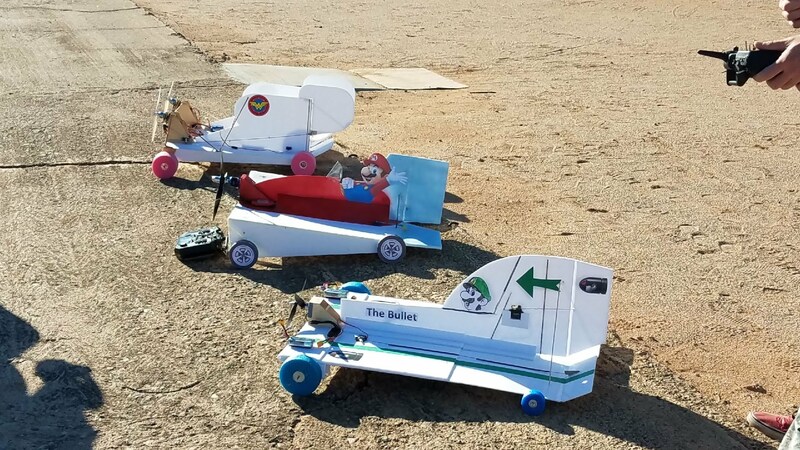 luigi broke both prop's on beginning of 3rd lap, mario was able to complete almost 2 before going in the bush, wonder woman came in 3rd with a wild 1 lap completed. regrettably 3 other competitors had fatal testing incidents prior to the race. but this does go to show, this can be done, and done pretty easily. video and article coming soon. All those Goblins without noses should start rejoicing! Looks like only one phase burnt, so must be a faulty phase wire connection, which has a similar affect as holding the propeller still while you give it power.